My sis is the greatest. In the mail today I was surprised by a tiny little package. I didn’t open it right away as I was knee deep in leaf raking. My back yard was a mess of leaves. Wet leaves, mixed with dry ones, I raked and bagged leaves for a solid two and a half hours. I had my earbuds in listening to native American Indian music on Spotify as I worked. The music selection seemed to fit the quiet of the afternoon. The rain had pretty much stopped. The sun was straining to make an appearance after a couple of days of gloomy weather and there was just a whisper of a breeze in the autumn air. I’ll admit that I’m a tad sore from the effort though It could be a heck of a lot worse if I didn’t work out on a regular basis. I figure an extra glass of wine is in the cards tonight for the fruits of my labor. After a luxuriously long hot shower I sat down with my glass of wine and opened the package. Inside was a little squishy toy. 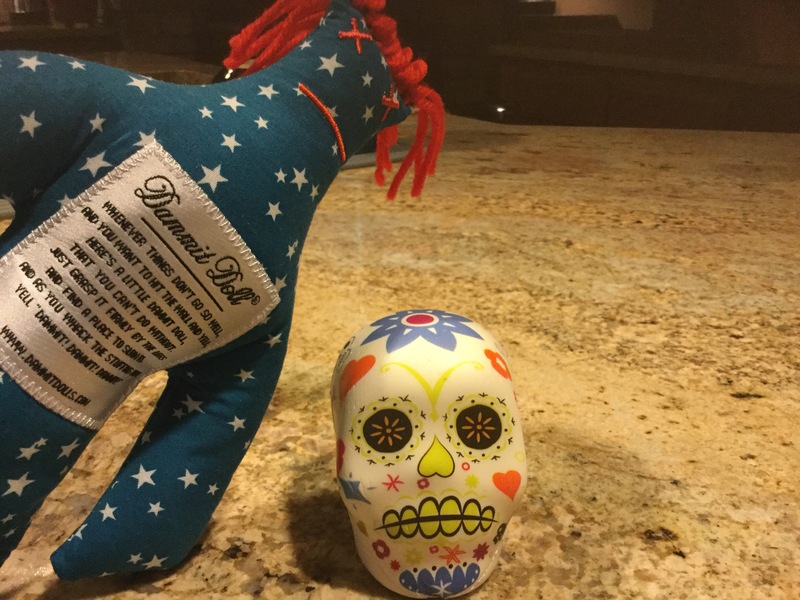 A skull….specifically a”Los Muertos” stress skull. A huge smile erupted on my face, followed by a joyful laugh. The Poodle was at my side in an instant to see what was going on. He jumped up to inspect what he thought was a toy for him. No, my four-legged fluffy love! This one is mine! And, how perfect it is! I can squeeze it this way and that as I pace back and forth while I talk to Rocket-man about the pressing issues with his mother. My Sis gets me (and, I’d like to think I get her!). For all the deep breathing, punching a heavy bag, and my still sporadic meditation practice, she knows that managing stress can sometimes be a challenge for me (and for her as well I’m sure she’d admit!). So my stress du jour is dealing with Rocket-man’s mother. Or rather….sitting helplessly on the sidelines and watching what is unfolding. Dementia is draining the personality right out of her. For weeks now she has been calling many times a day demanding her car which we have taken away, for obvious reasons. Her calls have escalated in frequency (sometimes four or five calls over the course of an hour), and her voice has reached a new crescendo. She is angry. Very, very angry. Her diatribes at every call are virtually identical, down to the last sentence. It is not a rehersed script; she truly does not remember five minutes ago. On the one hand my heart breaks. This behavior is not her fault. Her mind is disintegrating. Her life and her mind are out of her hands now. Still, it is extremely difficult to be on the other end of the phone listening to the diatribe. The latest call I took while I was trying to find an item at Bed, Bath and Beyond. I stood in the middle of the aisle next to the coffee makers listening to her red-hot anger. Thank goodness my next stop would be to my favorite fitness studio. There I would be able to forget for an hour at least. Naturally,this heart-wrenching decline is causing Rocket-man a great deal of angst. Together, we are trying to be patient because the woman that was is simply (and sadly) no longer. I am more mindful than ever….but for the grace of God, there go I. This could be me …or Rocket-man in just a few short years! This glaring potentiality is just another in a long list that keeps me awake at night. Rocket-man is trying to handle the situation with his mother from afar as best as he can as he works long hours and travels near and far. His sister is the one that lives minutes away from their mother and SHOULD be tackling the immediate stuff (powers of attorney, financial assessments, researching care options, etc.) and communicating …without drama…to her siblings who are at the ready to help. So many steps need to be taken to get Rocket-man’s mother in a better place and nothing…nothing …is happening! It is making my head explode. I take a deep, deep breath. This is not my mother. 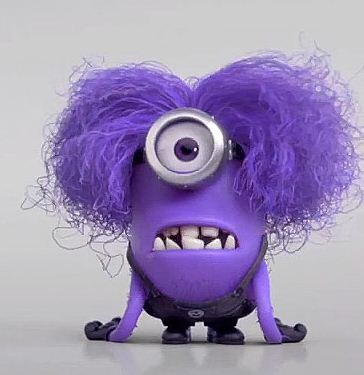 There is no use in turning into a purple minion over this. I have to let it go. Having gone through hell last year dealing with my mother, I can only whack my other stress buster, my “Dammit Doll” in frustration…and then let it go. Let me assure you, I can do this! I think of all that happened last year. My sis and I–with the loving support of our husbands–had things in place and on the road to manageable within a month after our step-father passed. It took a little over four months, but we had our mother moved and settled into a wonderful care facility. We could rest a little easier knowing that she was being cared for in such a beautiful place. I literally want to smack Rocket-man’s sister to China and back over what must be done and hasn’t been done! Months have ticked by! There is no excuse for her inability (and, to some extent, refusal) to dig in and get things done in a timely manner for her mother. It’s sad. Extremely sad. We’ve barely recovered from the ordeals of last year –emotionally and financially–and here we go again. God is giving us more. Aren’t we special. But, in all honesty, as I sip my glass of wine and ruminate on all that is happening in my world and the world around me, I realize that more than ever, I need to give thanks to every. little . thing in life that lifts my heart and brings me even the slightest joy. If I don’t, I’ll find myself down the darkest rabbit hole without the hope of any way out. So, this silly little stress buster arrived at just the right time! Every time I look at my little stress buster sitting on the kithcen counter a smile erases that moment of sadness or frustration bubbling beneath my complicated surface. When I think of the pain associated with my mother…or the ravages of dementia….or the loss of friendships over the past year….or a host of worries big and small….all I need to do is squeeze my silly little stress skull, or whack my Dammit Doll against the granite counter to get a sweet little release that, surprisingly, brings both clarity and levity to the moment. ← If It Smells Like Poo….